I went to San Francisco last week to do some research at a couple of non-digital archives—you know, the kind with actual, physical papers and books—but spent much of my time wondering what my life would be like on the west coast. Would I indulge in olive oil ice cream everyday? Teach in HistCon? Overcome my fear of driving on steep hills? What made Californians different from the Brooklynites and Bostonians I’ve known? Sound murmurs of the gentle night wind’s guest. Within the dusky coverlet of night. By 1914, the Pacific Railway decided to get out of the magazine biz, but as Starr points out, the magazine had already outlived its early promotional goals, publishing famous and soon-to-be-famous writers including Sinclair Lewis, Damon Runyon (read one of his poems here), and Jack London. Another major shift came in 1929 when the magazine was purchased by publishing mogul Larry Lane and his wife, who expanded the focus of the magazine to include the Great Indoors. This new attention towards the home may best be revealed by two of the covers from the thirties, below. 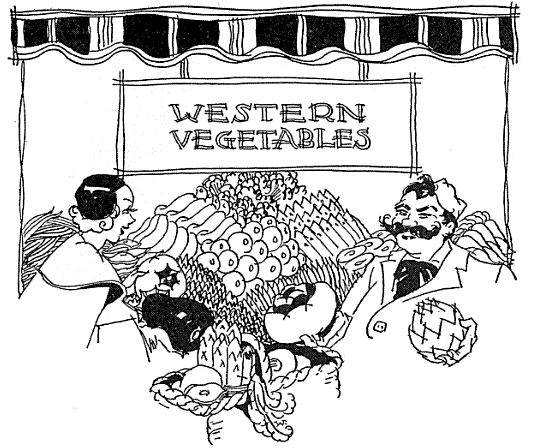 That decade also saw the release of the first Sunset cookbook, the All-Western Cook Book by Genevieve Callahan, available on the Internet Archive and on Google. Honestly, who had time to worry about the Great Depression when you were preparing artichoke soufflé? As Callahan exhorted, “Don’t let yourself fall into the routine of cooking just a few old familiar vegetables! Explore! Experiment!” Irony aside, I have to say, I love this illustration of a fashionable lady buying vegetables from an ambiguously ethnic market man. As far as I can tell from this brief browse, the Western ethos according to Sunset hasn’t changed much since then. The current issue still features awe-struck memoirs of trips to the wilderness, delectable recipes, gardening tips. But then again, so does the New York Times. If anything, it seems the West Coast no longer has much of a hold on Western living after all. That’s what I’m telling myself anyway.